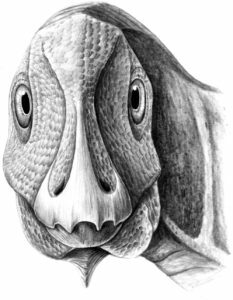 This week an [article] was published describing an odd growth on the face of a hadrosaur. Hadrosaurs are duck-billed dinosaurs, like the famous ‘Ducky’ from The Land Before Time. 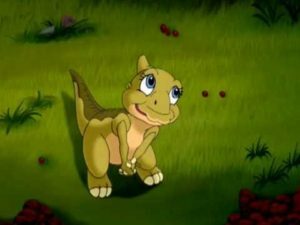 Ducky from The Land Before Time (from Universal Studios). This dinosaur is a specimen of Telmatosaurus transsylvanicus, which is a hadrosaur from the Cretaceous of the central part of Romania called Transylvania. Even though the hadrosaurs are a well-known group of dinosaurs, this specimen is special because it has a growth on its face. The authors of the paper used CT scanning to look at the inside of the bone. They found that the growth is probably a non-cancerous growth around the teeth of the lower jaw. Artwork of the specimen (by M.D.D.). This specimen is the 4th dinosaur found with this condition in Transylvania and the best documented. The most interesting part of this is that all the specimens found with this condition are hadrosaurs! For some reason, hadrosaurs got this growth more often than other dinosaurs.